Freedom, Easy, Fun, Family Time – A Fair Description of Cycling in London? I’d already seen posters with the same image dotted around the motor-dominated roads around here and had planned on whinging about them, but the leaflet means I don’t have to take the camera outside, and it provides more food for thought. There are four images of bikes throughout, with the frames arranged to read “Freedom” (on the cover), “Easy”, “Fun” and “Family Time”. Do those words come to mind when you’re riding a bike in London? He gets it! He finally understands that cycling should be for everyone, and for every-day tasks! So surely it follows that he wants to install Dutch-style infrastructure, which makes it safe, fast and convenient for kids to ride to school, or for granny to pop to the shops? Unfortunately, he seems to think that things are fine as they are – despite riding a bike in the UK being 30 times more dangerous than driving a car – and instead of getting the job done properly he seems to believe that yet another poster campaign and a few words of encouragement will turn London into a great cycling city. Seriously, Boris? I already cycle in London, and “great” certainly isn’t the first word that springs to mind. Sure, occasionally it really is great – around 3am when the back-streets are mine alone, it often feels great – but I don’t think that’s what anyone has in mind when we talk about building mass cycling. Use the TfL online cycle journey planner. But fingers crossed there isn’t an arbitrary closure with no diversion, or a van parked in the cycle lane! Use the cycle hire. A good idea, as long as you’re not one of those poor bastards who lives outside the cycle hire area, i.e. the vast majority of Londoners. Use the Cycle Superhighways! The less said about these the better. Use the back streets. Because we know the main direct routes are hellish to ride a bike along. Use a map. You’ll need one, because the route will be badly-signed with lots of turns through back-streets. The whole leaflet-and-poster campaign idea is such a half-arsed effort. I don’t doubt the good intentions behind it, but it’s really an admission of failure and defeat. 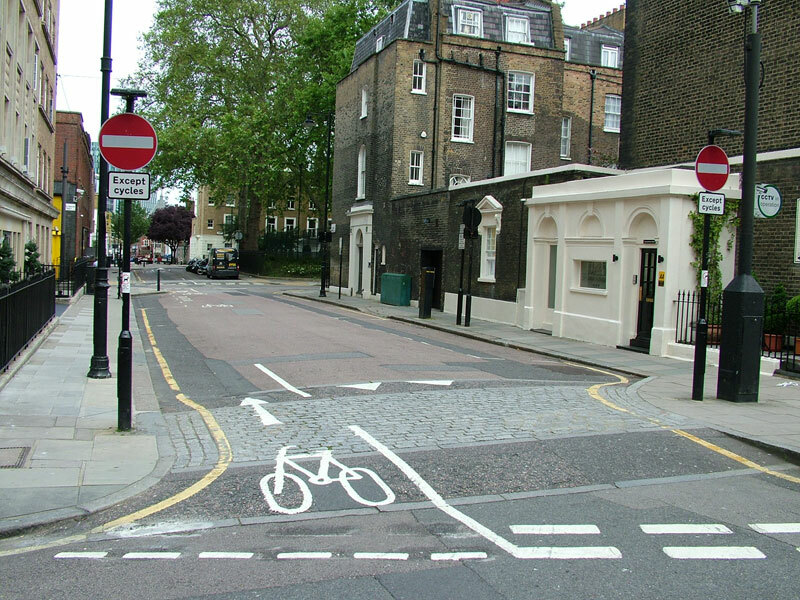 If the conditions were right, there would be no need for leaflets and posters encouraging cycling – people would do it anyway, they would want to do it, because it would be the cheapest, fastest, easiest way to get around. And it really could be the best way to get around. Even on a clunky hire bike I can ride from Waterloo to Kings Cross in about 20 minutes – and that’s taking a complex (but fairly quiet) route of back streets. That’s faster than the tube or bus, and about £10 cheaper than a taxi. So if riding a bike is so great, why do so few Londoners do it? Are they all blind to the wonderful world of cycling for transport? Why will this leaflet and poster campaign fail to increase cycling rates by any measurable amount? Is it because people are stupid, or haven’t seen the light? Or, maybe it’s because while it can sometimes be okay (and even “great” under very special conditions) riding a bike in London contains too many hazards and worries, too many nasty moments, and too many unwelcome surprises from vehicles and the authorities alike. Why are there no leaflets or posters recommending people take their car? (“Catch up with the car: Freedom, Easy, Fun, Family Time” – I can see it now!) The reason is because when people look at the streets around them, it’s obvious that the car is the most important mode of transport. It’s obvious that the country has been built around the car. It’s obvious that the car comes before all else in the UK, and therefore a car is the obvious choice for transport. To turn that around we need a sea change in the way roads are designed in this country, and until we have it, all the posters and leaflets in the world aren’t going to make any difference. I know this post is just a rant, but I’ll get around to making some positive suggestions soon! The no-entry-bypass (though strictly speaking I think it’s missing a cycle sign to the left?). 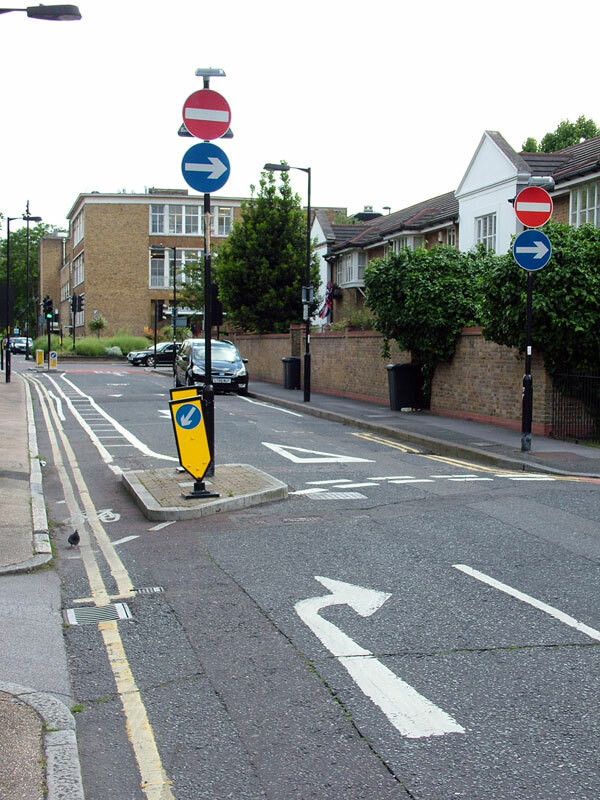 This also helps to stop vehicles coming the other way from turning right across a cyclists’ path, but takes up more room and is more expensive to install the island. No motor vehicles sign – though I’ve seen this ignored often. It just doesn’t seem to garner the same amount of respect as a no entry sign, for some reason. Well, Camden council must be congratulated on using the new rules quite enthusiastically! Due to one-way restrictions in the streets around Argyle Square, until a few weeks ago it was impossible to ride a bike from Tavistock Place/Regent Square to the hire bike dock on Belgrove Street at Kings Cross — well, not without tackling the horrible major roads around the area, or getting off and walking. 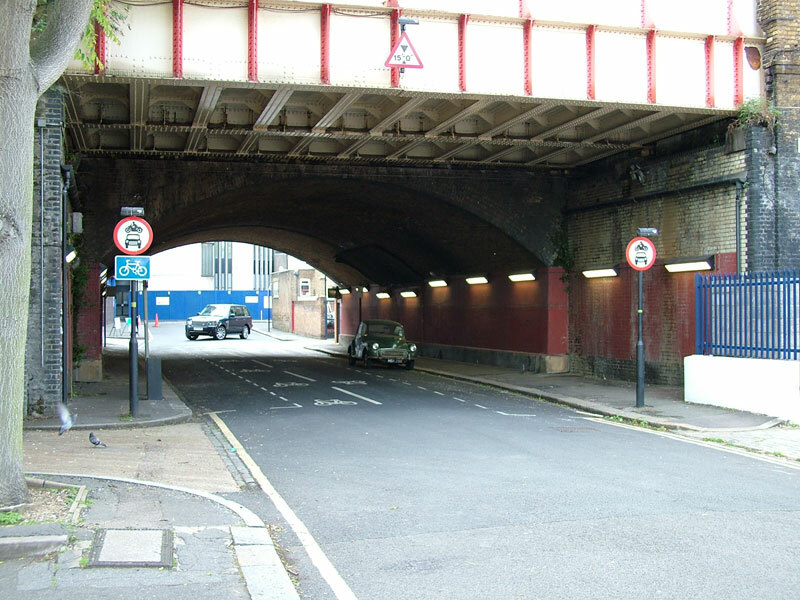 But now, thanks to a little road-repainting and some “except cycles” signs, this quiet and easy way to Kings Cross is now legal. Looking East from Argyle Street to St. Chad’s Street. Weird angle on the junction here! Looking North up Belgrove Street from Argyle Square. Those bike symbols are huge! 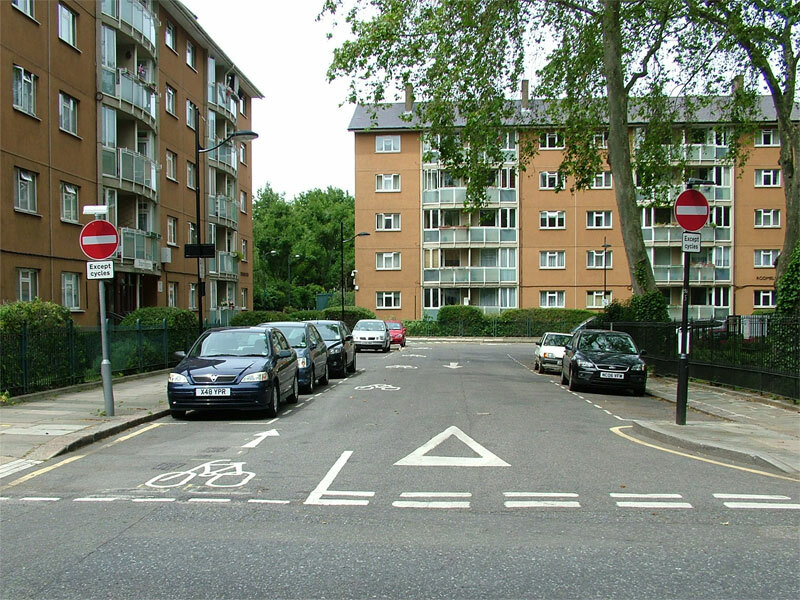 Since these photos were taken, green surfacing has been added to some areas to make it clear that there’s a bike contraflow, especially at junctions where it might not be clear to drivers that bikes will be coming from the other way. 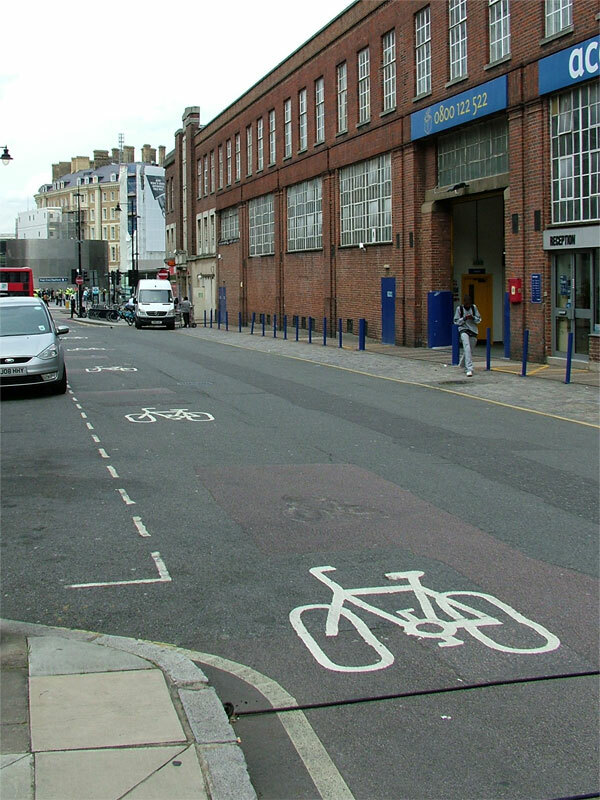 One other thing I noticed was that the bike symbols painted on the road are numerous and huge! I’ve seen these in a few places, are they DfT regulation or councils’ own? Either way, I do quite like them — they’re very bold and not too close to car doors, and the frequency of them helps to assert a cyclists’ confidence to be there. I’ve always found the streets around Argyle Square to be exceptionally quiet, especially considering they’re so close to the mayhem of Euston Road and Gray’s Inn Road. I don’t know if it’s by accident or by design that they follow the Dutch practise of making a neighbourhood useless as a through-route to motor vehicles — it’s impossible to use these streets to get anywhere, as they all lead back to where you started from (the little traffic that there is here is mainly taxis servicing hotels) — but either way I’m glad that this area is now more permeable to bikes. It’s a tiny change to the rules, but it provides councils with a cheap-and-cheerful solution to help make riding a bike for transport much easier.